We LOVE chili and when done in the crockpot, it allows me to throw it all together in the morning and let it cook throughout the day. The flavors have time to really come together and thicken up into a hearty dish. A few weeks back, I had posted a photo on Instagram of our homemade chili and there were a few of you who had requested the recipe…so this is for YOU! Josh and I usually just throw things together without measuring and each pot of chili comes out differently – it was nice to actually be a bit more mindful of what I was adding in. The ingredient list looks long at first glance, but eight of the ingredients are spices! 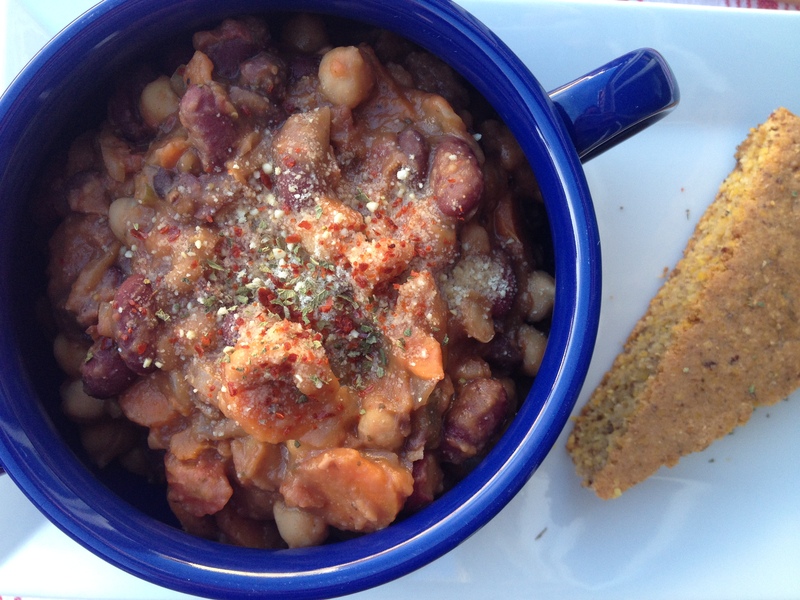 This was my first time adding in garbanzo beans (I had cooked up a bit pot of dried garbanzos, so I had plenty leftover) and it turned out really well. 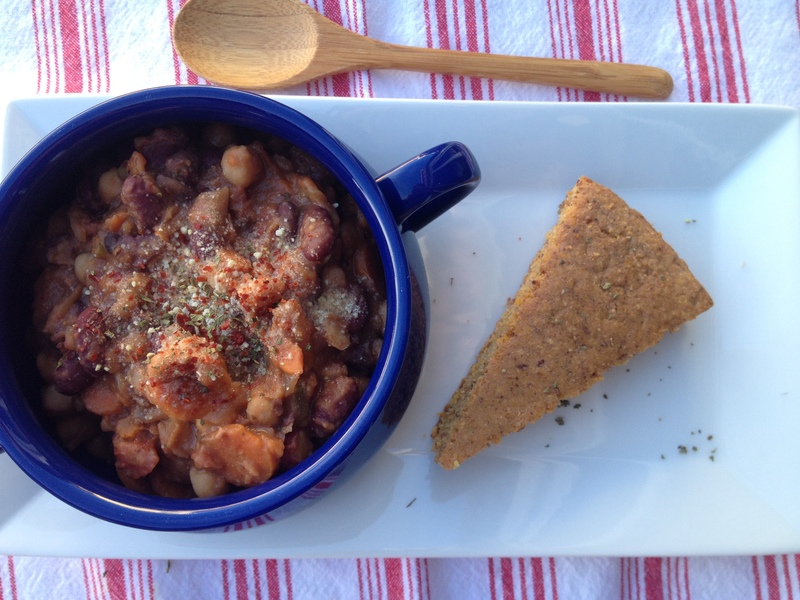 You can easily make this a two or three bean chili and using canned beans makes this recipe even easier! The night before, after Willow fell asleep, I chopped all my veggies to save that step for the following morning. *if you prefer a thinner consistency, you can add more water/broth during the cooking process. **we keep it on the mild side on the off-chance Willow decides to finally try our chili. Add more chili powder and/or chipotle powder to kick up the spice level. Wash and chop your carrots, celery, onion and garlic. Cook on high for a couple of hours, stirring occasionally. After two hours, turn it down to low and let it cook for at least another 4.5-5 hours. 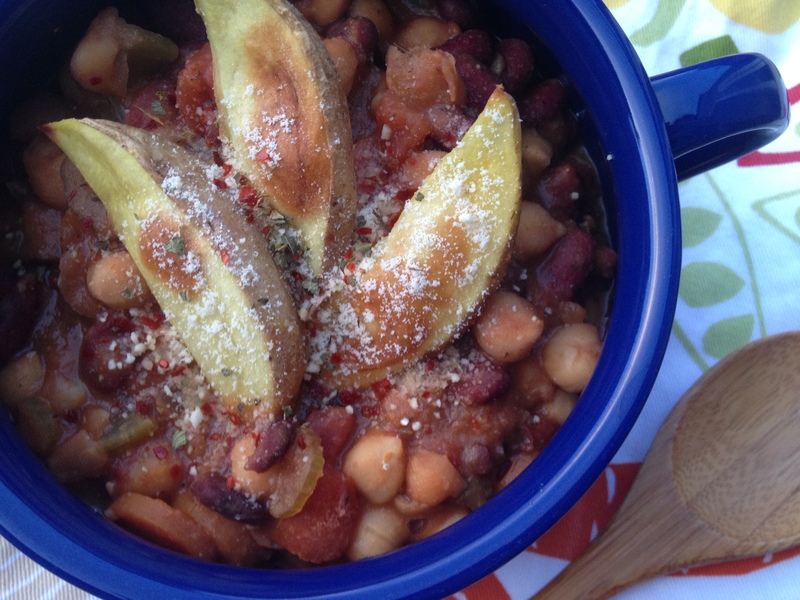 Serve with roasted potato wedges, cornbread, garlic bread or your favorite cracker/chip. ENJOY! ***If you do not have a crockpot, that’s ok! Grab a big pot and over medium heat, warm up approx. 1-2 teaspoons of broth or oil. Sauté your onion and garlic for five minutes or until they begin to soften. Next add in the carrots and celery, sauté for another 5-8 minutes. Then add in all the remaining ingredients – I would start with 1 cup of broth, adding more if needed. Cook for approximately 25-30 minutes or until your desired consistency/flavor. When done in the crockpot, it turns out more flavorful – but either way, leftovers the next day will be even better! We topped ours with homemade cashew parmesan, ancho chili flakes, oil-free roasted potato wedges and a dash of Mexican oregano. For those who celebrated, I hope you had a wonderful Thanksgiving and enjoy your weekend! Looks so delicious Mandy!! I will definitely be making this! Chili is one of my favorite foods ever and I make my Mexican Chili every couple of weeks, but I’m going to make yours next! I love that you added carrots and celery. Yum. How much salt did you add? I didn’t see it listed. Just wanted to know for when I make it! Or maybe it didn’t need it with the veggie cube? This chili was amazing Mandy!!! We gobbled it all up. I ate a HUGE bowl and both my daughter and husband loved it too! I love your recipes because we both share a love for similar ingredients, so I can just tell this would be awesome. 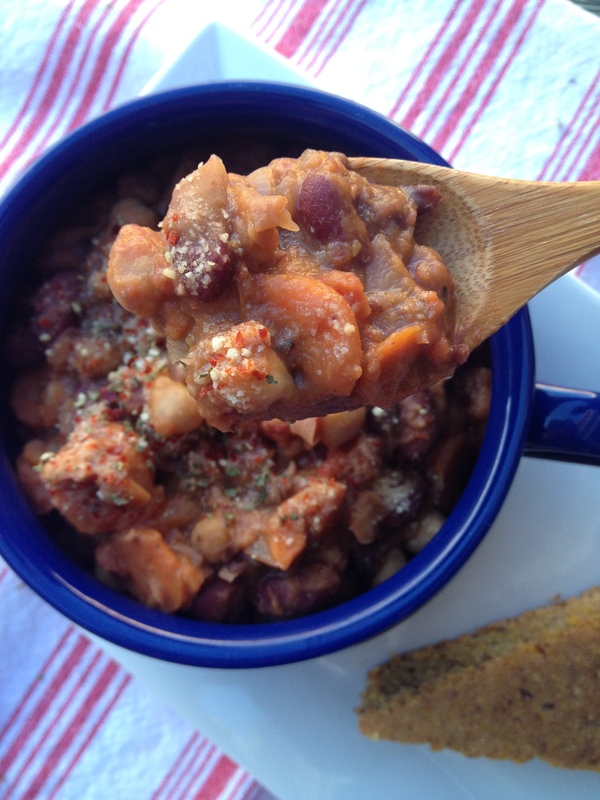 Chili is the epitome of comfort food and I loved how you added carrots…something I hadn’t tried before it chili. I loved the texture and flavor it added. Definitely will be making again!! Dumb question but are you putting the beans in dry? Thanks! Hi! Not a dumb question at all! I don’t think I was too clear in my directions 🙂 I used cooked beans…you can either use canned or cook up some dried beans.